Chopping down forests in the Brazilian Amazon produces a boom-and-bust economy that draws poor people to newly-cleared land but ultimately leaves them no better off, researchers reported on Thursday. 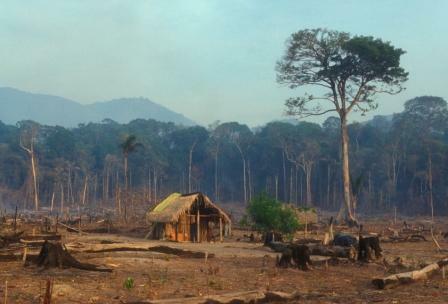 Environmental activists have long contended that this was the case but a new study in the journal Science quantified the phenomenon by tracking different stages of deforestation that have been occurring for decades. "Although it's generally assumed that deforestation is the price to pay for development, we found that development is actually transitory, it's not a sustained improvement in peoples' well-being," said lead author Ana Rodrigues. Ideally, scientists would have studied Amazon deforestation over time. Instead, they went to 286 municipalities at varying stages along the timeline of deforestation, development and decline, Rodrigues said in a telephone interview. The scientists monitored key indicators of human prosperity -- income, education and health -- among settlers along the Amazon's deforested areas. "We contrasted those values in different stages of the deforestation frontier: before deforestation kicks in, bang in the middle of the deforestation frontier and after it's already passed by," Rodrigues said. First, poor, often landless people from around Brazil flock to places where initial logging occurs, getting a quick infusion of money and an improvement in quality of life. The timber trade quickly gives way to farming and raising livestock. At first the land is fertile and productive but it soon declines. With no more timber to sell, settlers either stay on whatever land they have managed to possess or head for the next deforestation frontier. "We believe that the boom we see, the quick expansion ... in income and health and education is because people are very quickly exploiting natural resources that weren't accessible before," Rodrigues said. "What happens afterwards is a combination of population increase ... and the over-exploitation of natural resources." The Amazon and other large old-growth forests are increasingly valuable as repositories of climate-warming carbon dioxide; vegetation on farm fields and pastures does not store nearly as much. Any global agreement on curbing climate change is expected to include provisions to discourage deforestation.